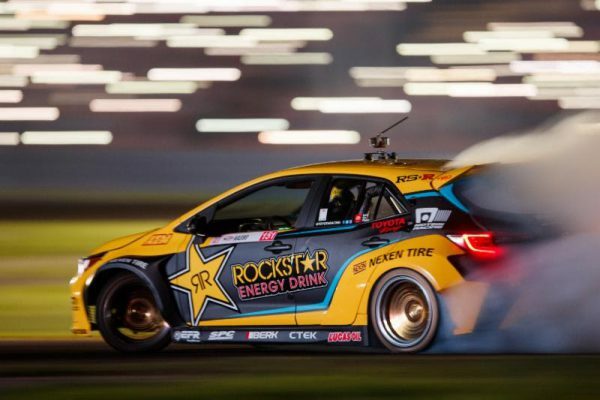 FORT WORTH, Texas (September 15, 2018) – In front of a cheering crowd just a half-hour from Toyota’s USA headquarters, Fredric Aasbo scored a podium result in the Rockstar Energy Drink / Nexen Tire Toyota Corolla Hatchback and celebrated a mathematical win for the manufacturer in the Formula Drift Auto Cup this weekend at Texas Motor Speedway. “We couldn’t have the support of a better manufacturer. It speaks volumes about Toyota that we are able to perform so consistently at the limit,” said Aasbo, who has been the top scorer for Toyota this year, with a record of five podiums in seven rounds, including two event victories. This weekend, Aasbo qualified fourth and advanced past Kyle Mohan in the opening round. Battling Chris Forsberg in the Top 16, Aasbo moved ahead when Forsberg lost his line in the tire smoke. In the Great 8, it was an all-Toyota showdown between Aasbo and Ryan Tuerck. Judges were unable to decide between the two drivers and called for a One More Time re-run, where Aasbo’s clean driving made the difference and he advanced. Facing James Deane in a highlight battle of the night, the Final 4 saw both drivers put down incredible runs. Deane ultimately advanced, while Aasbo’s drive saw him take third-place overall. It will be a three-way fight for the title heading into the final round. Aasbo now trails Deane in the championship by 49 points, while a win for Piotr Wiecek in Texas leaves him a further 38 points back. The 2018 Formula Drift title concludes October 12-13 in Southern California at Irwindale Speedway, a popular venue known as “The House of Drift” for its long ties to the sport. Formula Drift enjoys a dedicated and engaged audience with sell-out crowds all season long. This season, each livestream broadcast is averaging more than two million viewers, while Facebook impressions during the St. Louis event totalled 31 million.